Tacoma Wedding photographer Unique Moments Photography traveled to the Gold Mountain Golf Club to cover this fantastic wedding for Tabitha and Tulane Seville. We have covered a lot of weddings at private golf Clubs for weddings. They are always beautiful and have awesome banquet facilities for families to have a reception for friends to attend. Many golf clubs also provide changing areas and offer areas to actually have a ceremony which means the entire wedding event from start to finish can he held in one spot. This is very appealing for families. Make no Mistake about it. 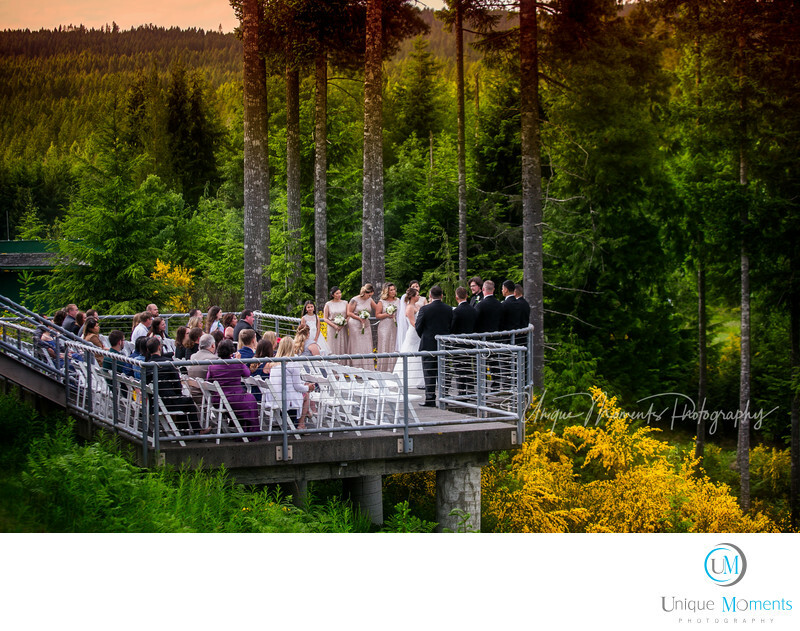 The Gold Mountain Golf Club in Bremerton Washington is one of the very best venues we have photographed at. The facility is simply stunning with photo opportunities being abundant for the bride and groom and their families.The staff is extremely accommodating and offer golf carts to get about the facility to capture the beauty. The banquet facility is lovely and the food that was served to the guests was top notch. The only drawback we saw was that there is no place for the guys to get ready at other than the public restroom at the golf club. The girls had a very nice changing area to use prior to the ceremony. We took a shot of the ceremony that was performed on the balcony outside the banquet room area. Its was stunning and is used for smaller ceremonies. Larger ceremonies use the grass area beside the club house. Every place you look, there is awesome views of the valley that this golf club sits in. There is simply not a bad view anywhere at Gold mountain. Your guest will love the chance to come out and be a part of your weddings so in our opinion this is a facility to strongly consider for wedding needs. We cant say enough about the awesome families and bridal party that was part of Tabitha and Tulanes wedding. Everyone was fantastic. These two have a strong support system and great families to help them begin their marriage. The ceremony was very emotional and everyone was happy to watch them exchange their vows. So on a scale of 1-10…….this wedding was a 100. We throughly enjoyed everyone and it was truly an Honor to be a part of this one. Congratulations to everyone. Photo count delivered to the clients at this wedding exceeded 1800 images. Location: 7263 W Belfair Valley Rd, Bremerton, WA 98310.